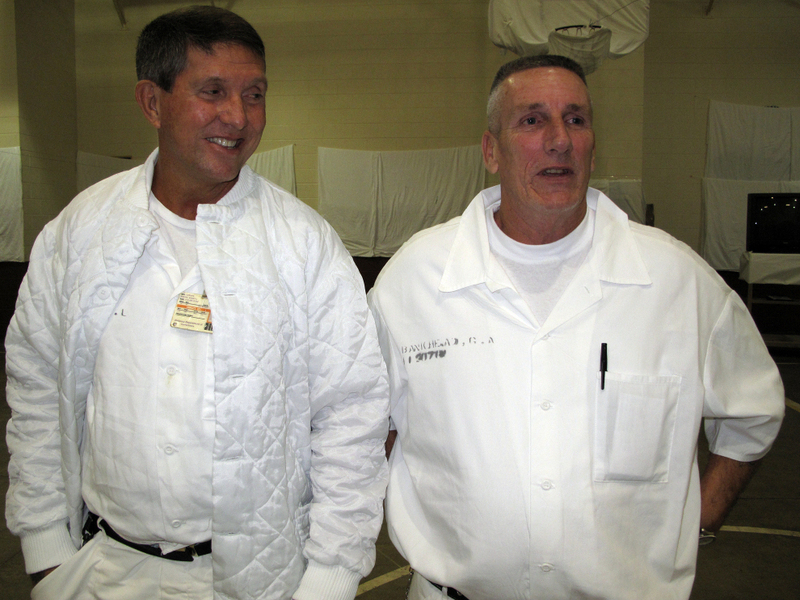 Johnny Mack Young, Lawrence Parker and Frederick Jackson attend graduation ceremonies at William E. Donaldson prison in Bessemer, Ala., after completing Vipassana meditation classes. The courses are held four times a year in the prison gymnasium. Deep in the Bible Belt, an ancient Eastern practice is taking root in the unlikeliest of places: Alabama’s highest security prison. Behind a double electric fence and layers of locked doorways, Alabama’s most violent and mentally unstable prisoners are incarcerated in the William E. Donaldson Correctional Facility outside Birmingham. Many of them are here to stay. The prison has 24 death row cells, and about a third of the approximately 1,500 prisoners are lifers with no chance of parole. “You’re dealing with the worst offenses that have been committed by humans in the state of Alabama,” says Gary Hetzel, the warden at Donaldson. The lockup has a history of inmate stabbings, deaths and suicides and is the target of lawsuits. The prison is named for an officer killed here in 1990. During chow call in the isolation blocks, food trays are slid through a narrow metal box built into the cell doors so the inmates can’t hurt the officer feeding them. That’s a sharp contrast from the scene inside the prison gym, where about two dozen inmates in white pressed uniforms roam freely, working together to clear bed pads from the concrete floor. Convicted murder Johnny Mack Young in the meditation stance he keeps for nearly 10 hours a day during the 10-day silent meditation course. 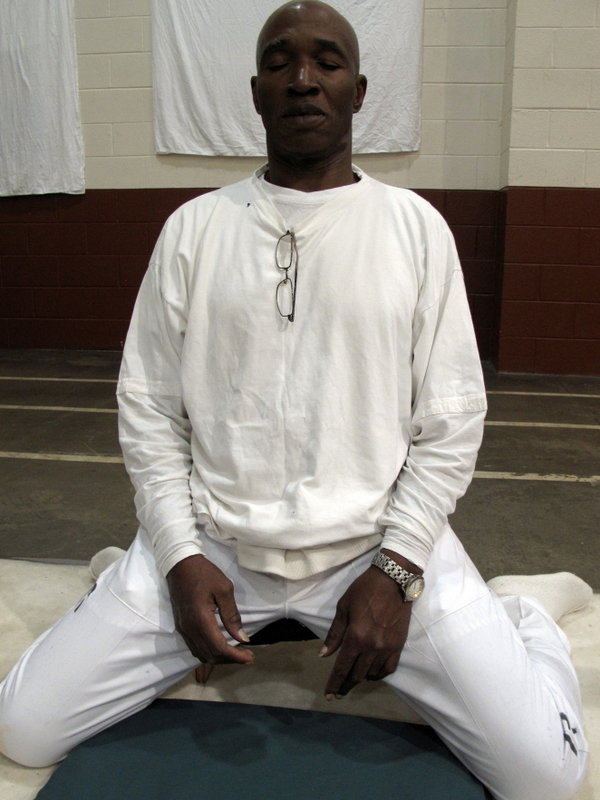 Officials say the meditation program is reducing violence at Alabama’s highest security lockup. “It changed my life,” Young says. “Vipassana means seeing things as they are,” says inmate Johnny Mack Young, as he kneels on a blue mat, resting back on a small wooden stool. This is the position he keeps for up to 10 hours a day during the intense silent-meditation course. 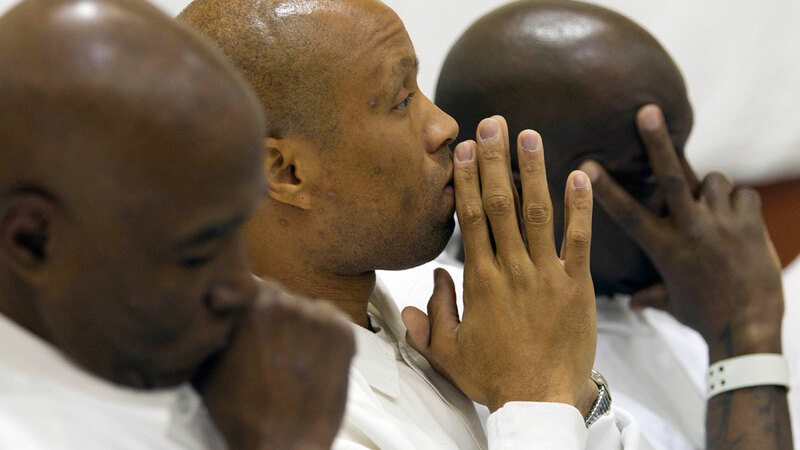 Isolated in the gym, the inmates wake up at 4 a.m. and meditate on and off until 9 p.m. They eat a strict vegetarian diet. They can’t smoke or drink coffee. And there is absolutely no conversation, only an internal examination of how the body is reacting. It’s a rude awakening for some prisoners, Vipassana teacher Carl Franz says. “Everyone’s mind is kind of Pandora’s box and when you have 33 rather serious convicts facing their past, and their own minds, their memories, their regrets, rough childhood, whatever, their crimes, lots of stuff comes up,” Franz says. For Young, a convicted murderer, that stuff includes his childhood role in the accidental death of his baby sister, the fact he never mourned his mother’s death and his crime -– a drug-related murder. Now, aged 61 and likely in the last home he’ll know, Young says he just tries to have the highest quality life he can. He says that prior to taking the meditation course, he was in trouble a lot, fighting and trying to escape. “It changed my life,” he says. Cavanaugh says inmates who go through the course have a 20 percent reduction in disciplinary action. But it hasn’t been an easy sell in Alabama, a state known for harsh punishment policies like chain gangs and hitching posts. The Vipassana technique, though secular, is based on the teachings of Buddha. Soon after it started at Donaldson about a decade ago, the prison system’s chaplains expressed concern it might not be in keeping with Christian values. The state put an end to the program. He’s also found they come out ready to help other inmates by volunteering in the prison’s hospice unit or leading self-help courses at the prison chapel. Hetzel says he’s convinced the program is not religious and he’s encouraged staff members to take a mediation course to dispel misperceptions. Donaldson Chaplain Bill Lindsay is still skeptical, but now tries to give Vipassana the benefit of the doubt. “It’s kind of strange, something different,” he says. But he acknowledges it seems to work. Rick Smith (left) and Grady Bankhead, who participated in the meditation program, are serving sentences of life without parole for capital murder. “We have to have some kind of balance back in our lives from the horrible things that we’ve done,” Bankhead says. To date, 430 inmates have gone through the Donaldson Vipassana meditation program, the only one of its kind in North America. There’s a waiting list for the quarterly sessions and the state wants to expand the offering to its women’s prison. Filmmaker Jenny Phillips made a documentary called “The Dhamma Brothers” about the Alabama program and its unlikely marriage of an ancient meditation practice and an end-of-the-line prison. Behind the secure prison walls, Grady Bankhead, 60, says he’s walking evidence of that fit. A convicted murderer who came within hours of being executed before winning a new trial, he is now serving life without parole. “When I was 3, my mother left my little brother and I out in [the] farmhouse, dressed us up like we were going to Sunday school or church, and said she’d be back in a little while,” Bankhead recalls. He didn’t see her again until he was on death row. His brother had died. “And I blamed me for not taking care of him,” Bankhead says. Now, he’s recruiting other inmates to take the difficult course. “We have to have some kind of balance back in our lives from the horrible things that we’ve done,” Bankhead says.